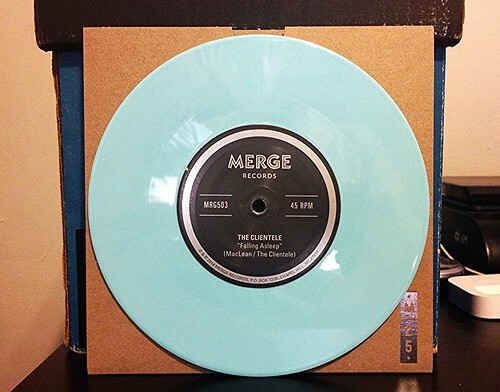 This record is the March edition of the Merge records Or Thousands Of Prizes singles club. Unlike the first 2 volumes, this isn't a split 7". For March they decided to let Clientele have both sides. Off all of the bands that have participated thus far, I'm not sure why Clientele earned their own 7". If it was me, I would have given that to Superchunk. Not that Clientele is bad. They're not at all, but they are a little forgettable. The A-side, "Falling Asleep," isn't one of those songs that you can't figure out why they called it that. It's pretty mellow and honestly a little boring. Dreamy vocals with a slight layer of cloudy distortion over hippy-esque 60's music. It reminds me of Donovan a bit actually, but with less energy. On the flip side is "Orpheus Avenue." It's also slow paced built over a layer of gently plucked acoustic guitar. In some ways it reminds me of Sea Change era Beck, but with none of the gravitas or importance that Beck can muster out of a song like this. I wouldn't say either song was bad or not worth a listen, but at the end of the day both are a bit boring and I honestly can't see myself getting the itch to listen to it again.